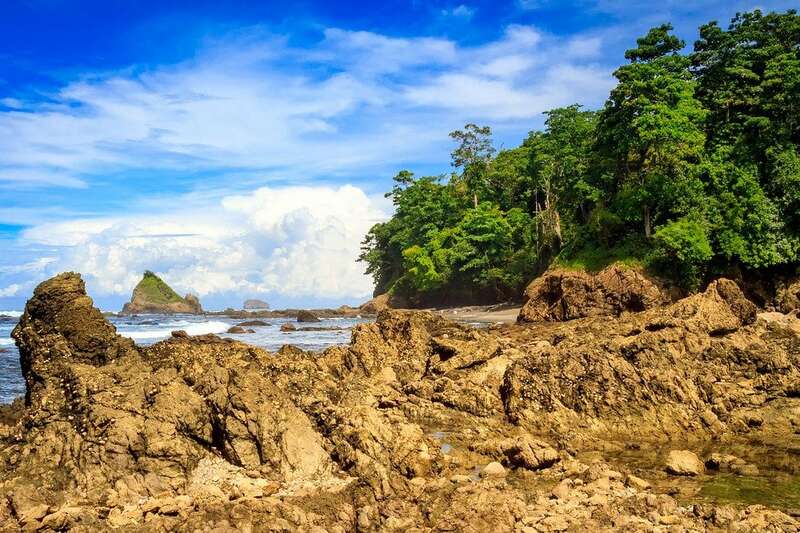 Corcovado National Park is a remote environmental reserve in Coast Rica with great hiking past deserted beaches, waterfalls, pristine rainforest, and plenty of wildlife. UPDATE: The rules changed in 2014, and unfortunately you can no longer hike Corcovado alone. Visitors must be accompanied by a professional guide. 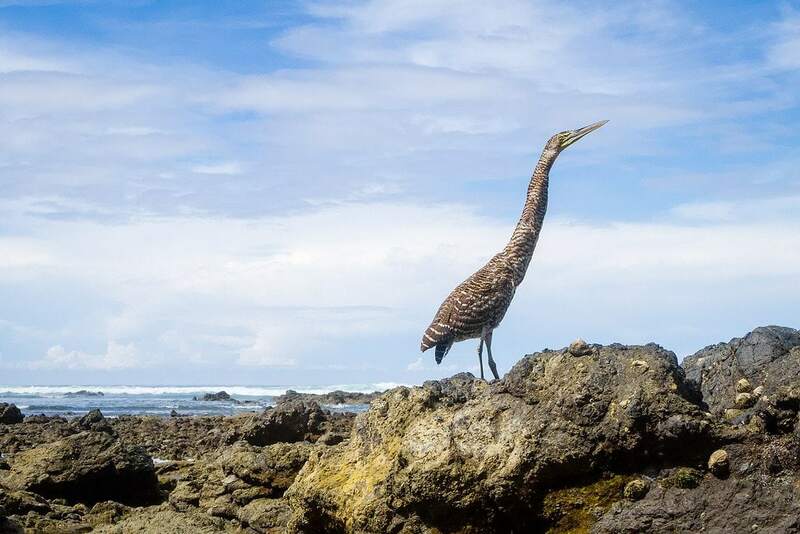 Costa Rica has many different National Parks. While Corcovado isn’t exactly the easiest of them to visit, it’s easily been my favorite so far. There’s no road access to the park’s boundaries. You either have to hike in or arrive by boat or small bush plane. I opted for the most exhausting and least expensive option. My own two feet! A physical challenge for sure — but it turned out to be a wonderful choice. 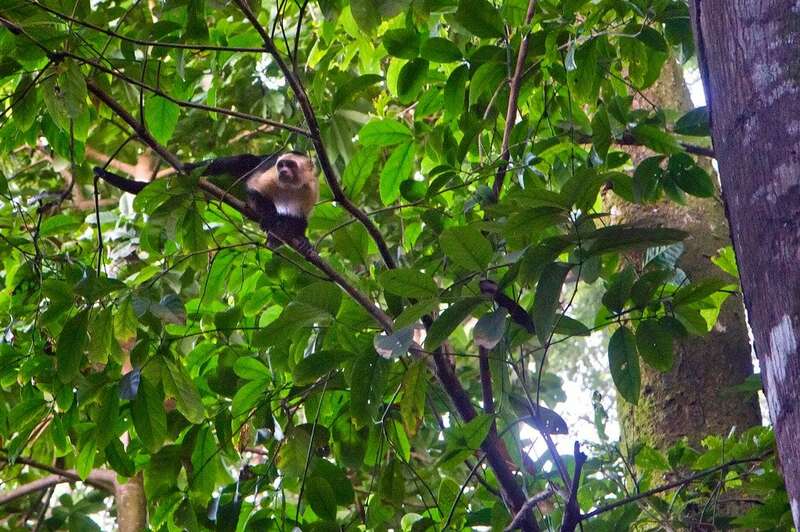 After 4 days of solo-trekking through Corcovado, I was able to meet a wide variety of wild animals I’d never seen before. Need A Place To Stay In Costa Rica? My journey into Corcovado began in the village of Puerto Jimenez. Camping in the reserve is only allowed at ranger stations, and the few spots available can be booked up for weeks in advance. After securing the proper documents for entry, I was forced to wait around town for 5 days before I could begin my adventure into Corcovado as all the camping spots were full. A small price to pay for what I was about to experience. 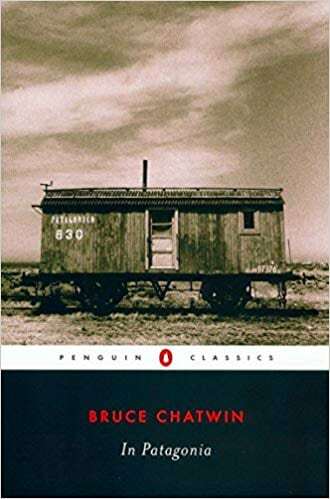 When it was time to leave, I jumped into the back of a livestock truck filled with local families for a bumpy 3 hour drive over a rutted jungle road towards the village of Carate. 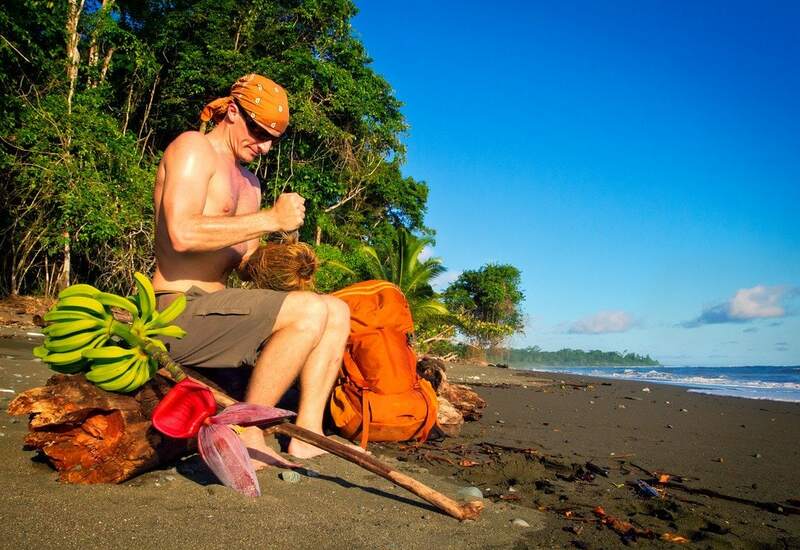 Once I arrived at Carate I re-checked my gear, food, water, and set out for the first day of hiking on a beach through pouring rain. Arriving the La Leona Ranger Station park entrance about an hour later, the storm continued to pound down as I set up camp. A wet afternoon was spent wandering around nearby trails in the rain watching spider monkeys get angry at me, gangs of scarlet macaws flying overhead, a toucan, and some frogs. There’s something special about hiking under the rainforest in pouring rain! After a comfortable night’s sleep in my camping hammock, I rose before sunrise on the second day to prepare for the long trek ahead. 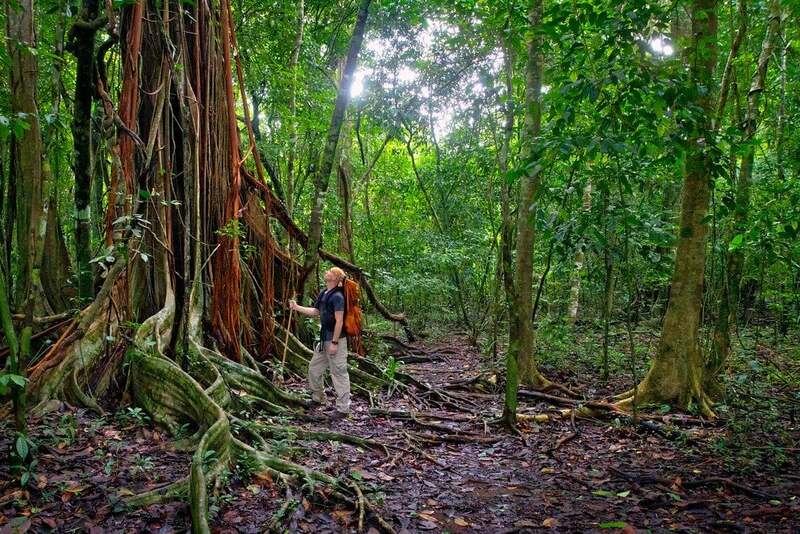 A 9 hour hike over secluded beaches and through winding rainforest trails to the Sirena ranger station. Right away more animals came out to greet me on my travels. 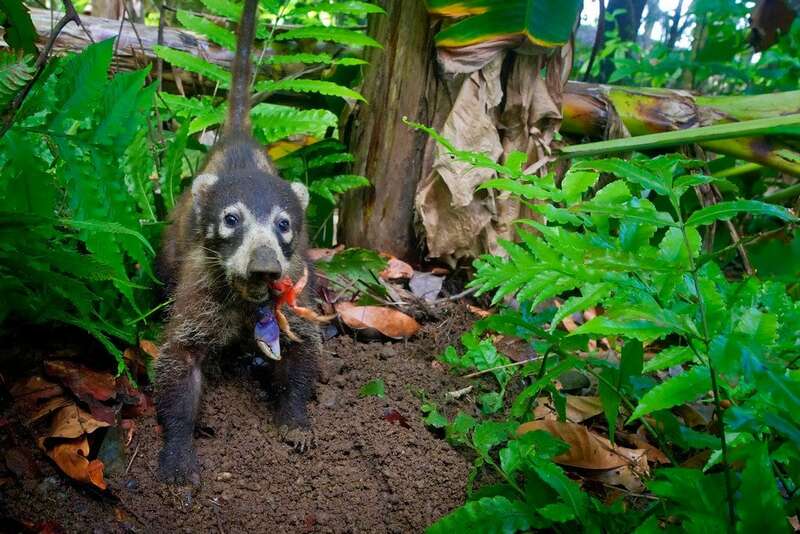 The first was a large family of about 20 Coatis digging for a delicious breakfast of Halloween Crabs. While those colorful crabs looked kinda tasty, I had a long trip ahead of me and couldn’t join them. But the sky was finally clear and I was off to a great start. Spider monkeys need to take some anger management classes. Hiking further into the jungle, a brown snake of some kind darted out from under the leaves near my feet. Luckily it wasn’t in a striking kind-of mood! I secretly hoped the rain would come back! Sections of beach were absolutely covered in hermit crabs, making it look alive. Beautiful groups of Scarlet Macaws were having conversations with each other as they flew low over my head. Eventually I stopped for lunch. Resting under the shade of a large palm tree, I went for a quick swim in the pounding waves. A cold waterfall back near the edge of the trees served as my fresh-water shower. The rest of the trip was spent crossing rivers, wading through tide-pools, losing the trail, running after Jesus Christ Lizards, climbing palm trees, and having a blast. Finally after a long & exhausting (but scenic) 9 hour day on the trail, I arrived at Sirena Ranger Station in the heart of the reserve. Throughout the hike I hadn’t seen a single person until I set up camp and made dinner with 4 others on a platform at Sirena. Howler monkeys roared at us from the trees in the twilight as I quickly fell soundly asleep. The morning of the 3rd day I rose and prepared a hardy breakfast of canned tuna and refried beans wrapped in tortillas. Yum! Refreshed and ready to explore Corcovado’s network of trails, I marched into the dense jungle yet again. While shooting images of giant vine-entangled trees along the muddy banks of the Rio Claro, I was surprised when a group of armed local men came trudging by. I said hello as they took off their boots and began to cross the river. Only then did I notice that two of the men were in handcuffs! Unfortunately poaching & illegal gold mining in Corcovado is a constant problem. The park rangers had arrested 2 young men and were leading them out of the forest. It was comforting to see that Costa Rica’s laws were being enforced to protect the area. 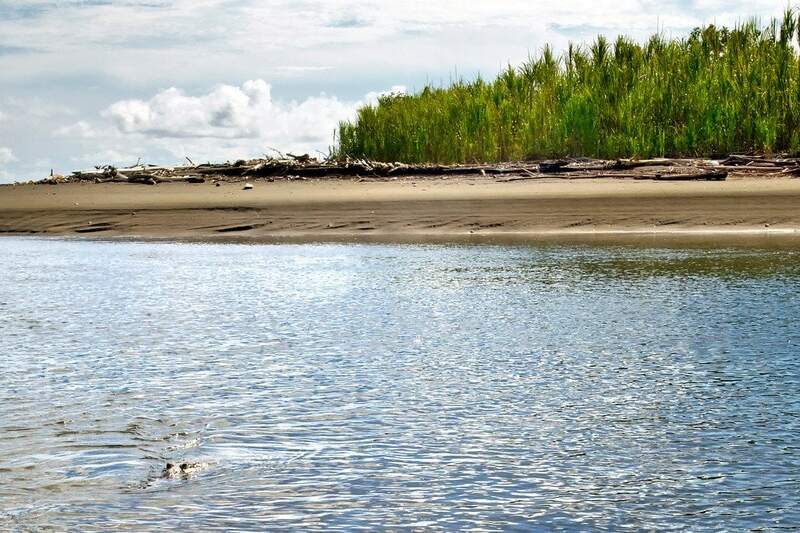 There are several river crossings on the way to Sirena, and they can be dangerous to cross at high tide. Not only can the water be up to your neck, but 12 foot (4m) long Crocodiles and aggressive Bull Sharks are often found in the rivers feeding on schools of fish. This is why proper timing of your hike with tidal charts is so important, as I was about to find out. I decided to follow a trail that led me to the Rio Sirena. The tide was starting to rise, but there seemed to be enough time to cross it, explore the other side for a bit, then get back before the river monsters came out to feed. So after removing my boots and finding a tree branch to help support me in the deep water, I started across. Suddenly a pair of eyes broke the surface in front of my legs! A large Crocodile was staring me down less than 3 feet (1m) away. After freezing for a second not sure what to do, I slowly backed out of the water, pulled out my camera, and took a photo. Unfortunately my river crossing attempt had been canceled. I waited for high-tide to see if I could spot some bull sharks swimming into the mouth of the river looking for fish. It wasn’t long before I saw fins darting over the water in the area I had been planning to cross! What the #%@$ is That!? The sun had started to set, which meant it was time to head back to the ranger station for the night. Secretly hoping to see a Puma or Jaguar before I left the next day, my senses were on high-alert. Without warning something came crashing through the jungle behind me. Running back out the way I came, I found the strange animal eating on the edge of the sand. It looked like a crazy combination of pig, donkey, and anteater rolled into one. The animal is called a Tapir, and I was surprised at how big it was. At almost 4 feet tall, and at least 6 feet long, it’s the largest land mammal in Central America. It’s also in danger of extinction due to hunting & loss of habitat. I watched this guy munch on leaves for a while, and soon it wandered right up next to me. It’s snout moves around independently like an elephant’s trunk, which looks quite funny up close. I think he was trying to chat with me. Another new rainforest animal friend! Not included in the list are other frogs, snakes, fish and birds that I couldn’t identify. After an 7 hour trek back to the village of Carate, I greedily slurped down a few tasty beers and fired-up my last Nicaraguan cigar while waiting for the dreaded 3 hour truck-ride-from-hell back into town. Cost: $93 US in park fees, camping, & food for 4 days. Have any questions about hiking Corcovado? Are you planning a trip? Drop me a message in the comments below! Thanks, Matt, you’ve breathed a sense of adventure back into me. I’m headed to CR February 3d & trying to figure out Osa/Corcovado especially, Uvita, and Manzanillo. I’ve read everything I can find on your site and wonder if you’ve additional info or guidance. We are going to Coecovado now and Ideally want to repeat your adventures. We are in Ojochal. 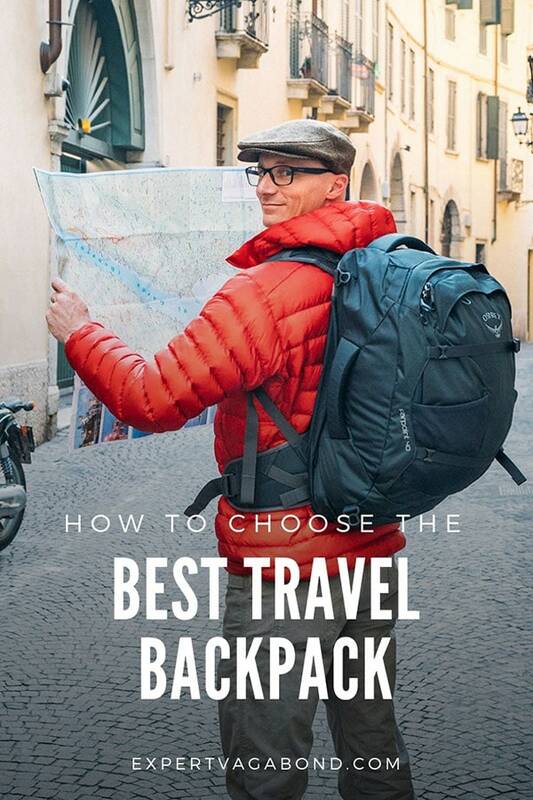 Where do you recommend to go to arrange a (cheaper) guide? Drake or P Jimenez? We have a week. Want to spend 3-4 d in park. Will you let me know how you got there? I’m going in March and need to plan ahead. Thank you. Hi Matthew. I just stumbled upon your blog, very interesting! Also very nice to read about your experience in Corcovado. The Costa Rica – Bocas del Toro trip last year was my first solo trip ever. Only lasted one month and from the moment I got back to Belgium I’m having wanderlust. Not only the exploring, but also the complete freedom I have experienced was indescribable. I am reading a lot about travelling and hope to get out there again soon, for a long time! If you ever visit Belgium, try some of our beers, if you already did, you know what I’m talking about! Best of luck. I was looking for info about corcovado and came upon your page . What a great orator you are . Your adventure sounded so beautiful , humbling and exciting ! I am in costa rica now and my next stop is corcovado . I think i will apply for my permits now so i do not have to wait 5 days . Do you have more adventure stories online? I have two questions however, perhaps you know the answer to it. 1. You also took with you some photography gear. Photography is definitely something I would love to do there however I am a bit concerned about the effects of the climate on my gear (my camera and lenses are my most precious good so far :)). Did you had any problems with the moisture? 2. It looks like since the beginning of 2014 you are only allowed to enter the park with a guide. I can’t afford that for long so how are the surroundings of the park? Can you see similar scenery without the need of those hazzles? Great summary of one of my favourite parks in Costa Rica! I’m so jealous you got to see a tapir (and up so close!). Other than a jaguar, it was the animal I wanted to see most while I was there. Not everyone sees them either, it was good timing at sunset when they come out of the forest to eat near the beach. This is so great! Did you by chance keep a copy of a checklist of what you needed to bring? Or what you would need next time to make anything easier? Thibking about doing this soon with some friends . Thanks for sharing! I found your site via your YouTube video on Corcovado. This is all great! I am headed to Costa Rica in mid-April and I am trying to plan out a trip to Corcovado myself. I just emailed the station to get a permit reservation, hopefully everything works out. I prefer to sleep in a jungle hammock, do you know if they would allow me to set mine up around the station? Is there a suitable place to even hang a hammock or do most people sleep in tents? Any advice is much appreciated! They have covered areas for setting up tents, but you can also hang a hammock. At Sirena Station there are raised wooden platforms, like outdoor decks with a roof. Not sure they’ll let you hang your hammock in trees, but you can hang it off the wooden posts holding up the roof. Some people just bring a mosquito net and bedroll to sleep on the covered deck. Corcovado is an incredible place, have fun! Absolutly amazing! Thanks for bringing me to the heart of Costa Rica with your post! This post reinforces the fact that this is the NP I want to go to in Costa Rica! Firstly, you rock for doing all this work that is so helpful to other travelers and so entertaining to many others. I hope you’re making ends meet. I’m landing in Costa Rica in three weeks and am probably not nearly as prepared as you, but hope to have some similar journeys. Think I can get away with hammock camping everywhere? How did you find out you had to make arrangements for the national parks? I had no idea. I’ll share your blog with friends to possibly help you out. 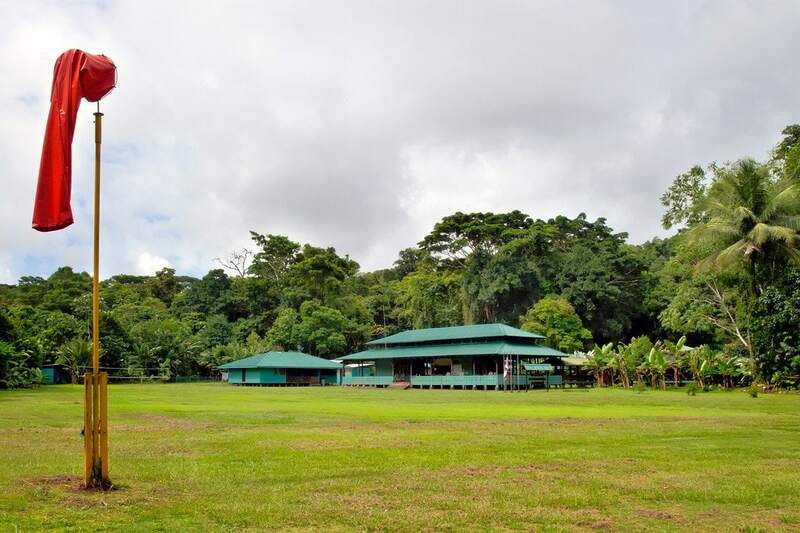 Corcovado doesn’t allow camping on your own in the park, but you can camp at their ranger stations. The rules are different for each park though. Most of the parks will have a website explaining the rules. I also use the Lonely Planet Forum to research places and ask questions. Dude, you shoot some amazing videos. Also what are Coati? Bears? They are actually part of the Raccoon family. I have no idea where the nickname came from… I guess they kind of look like little bears? Great photography and such interesting companions-colors are so vivid. 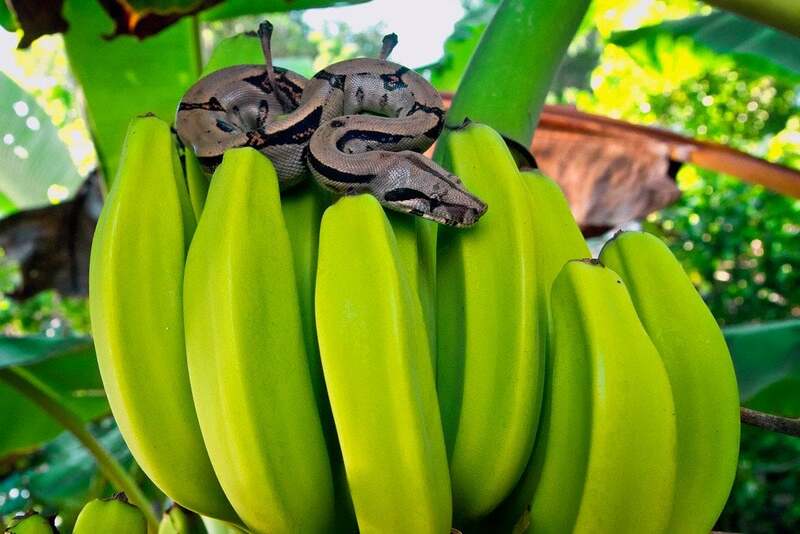 The snake on the bananas is just awesone. These are some great shots! When I was in Argentina I was surrounded by about 20 coatis all keen on stealing my tripod that I had left about 5 meters from where I was taking photos. 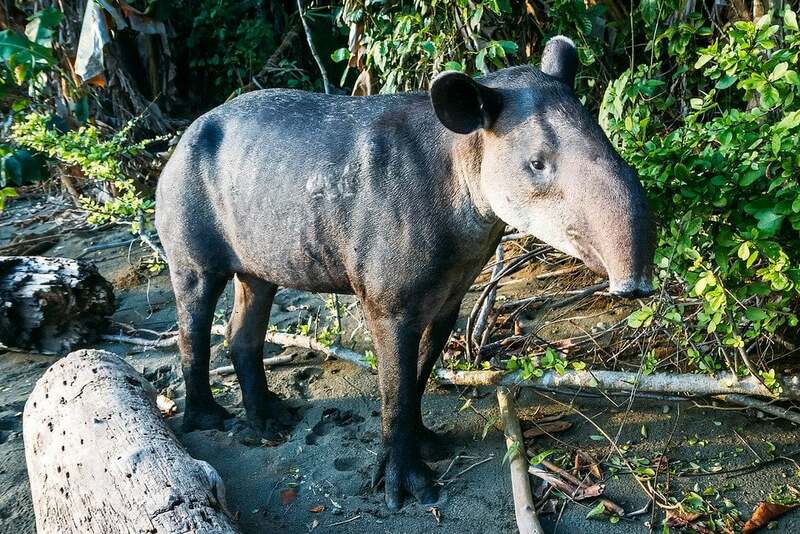 I’ve got to admit I had never heard of the Baird’s Tapir – that would have definitely been a surprise! Excellent synopsis of the park. I can’t believe you had to wait in town for 5 days to begin. I got in the next day, but I had to hire a guide and fly into the park. I only had 10 days in Costa Rica, so I did not have time for the lengthy permit process. Next time I come though I want to make the hike from Carate. Great post and awesome video. I am sitting at home in Chicago drinking my Costa Rican coffee reliving some of my Corcovado memories through your post and video. I was taking pictures of a crocodile at the river crossing you were talking about when downstream some Danish people crossed. I showed them pictures of the croc further upstream and they were quite amused. Glad you were able to backtrack out of danger. Beyond, beyond incredible!!! I loved this post! That 1st shot is AMAZING! Like always a great video matt! “Making friends with wild rainforest animals.” Then you come home and cook AND eat a chipmunk! That Croc knew what you were going to do and was going to get even. You’d better watch your back. A Jesus Christ Lizard just could be your Last Supper. A bunch of Howler monkey’s is just like being with a bunch of teachers at a get-together. How could you fall asleep? You might damage your hearing. The tapir is awesome! Looks like a stepchild of a rhino and an elephant. haha. It is one funny looking animal! Surprisingly big too. Thank you for sharing so many gorgeous photos and the video as well as the blog post itself. I can’t wait to browse through the rest of your blog!